I’ve spent a lot of time on email. We all do. It’s just so time consuming. Unless we are careful, it’s very inefficient. Each week, I spend an average of 14 hours reading and responding to email messages. That’s a lot. So of course, it’s hard to find time to write articles. The tyranny of email is a big reason that 29% of bloggers write at nights and 31% write articles on weekends (source). We’re all too busy fighting our inboxes during business hours. Confession: I’m writing this paragraph at 6:43am on a Sunday morning. Sound familiar? It also sounds crazy. Because time spent on email is time spent writing. 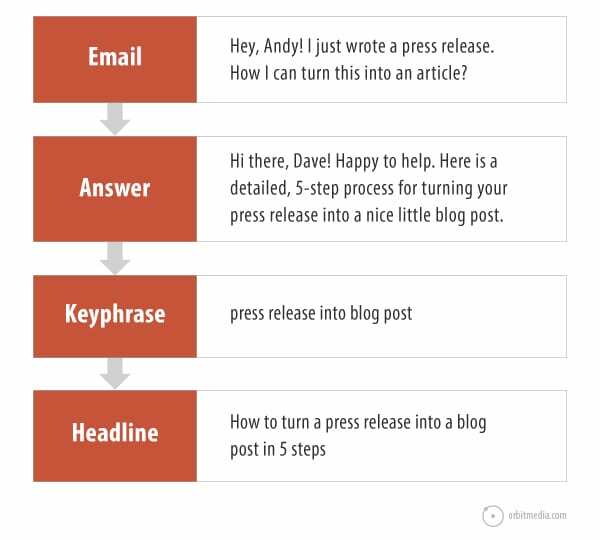 You just need to learn how to turn your sent emails into marketing content. Here are the step-by-step instructions for turning email time into marketing time, magically transforming your outbox into high ranking articles. I’ve also added details on how I turned three years of email into almost 100 pages of content, including some high ranking posts. A lot of marketers decline to contribute, but as you’ll see here, there is a huge advantage of accepting virtually every request to contribute to round up posts. Even if your response rate is low, the responses themselves are content, which you can repurpose by converting into high ranking articles. 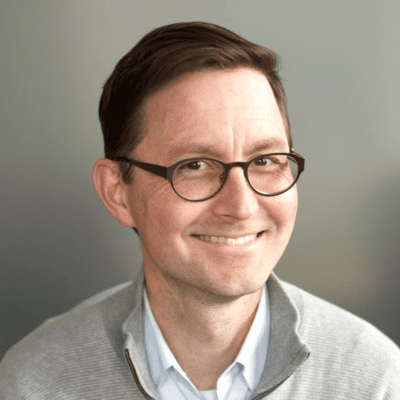 Faster and easier to create than guest blog posts, if you have ever been interviewed over email, this is also excellent material for repurposing. Once you begin to think this way, you’ll find other source material you’ve already created. To make these emails better source material, go big. Add lots of detail, formatting, images and links. Work harder at the advice you give over email, knowing that you’ll be coming back to these later. You’ll also find people’s responses are very grateful. Here’s the response to some very detailed advice I sent over email. Was it worth the extra time? It earned me both content I can repurpose… and an offer for a beer. What I did: For three years, I answered every question, responded to every round up invitation and accepted every email interview. Each answer was super detailed, included images, links and bullet lists. Do this for the rest of your career: whenever you write a detailed email that explains anything, BCC yourself or move it into a folder. Keep them. That’s it. Now you’ll have a growing pile of raw content, ready to be mined later. What I did: I created a folder called “Content Marketing.” After sending answers and detailed responses to people, I moved those emails into this folder. 3. Move the emails into documents. Organize by topic. Once your email folder starts to build up, it’s time to start moving these nuggets down the production line. Copy and paste them into a master document. Then you can delete the emails, so the folder only contains raw, unprocessed answers. 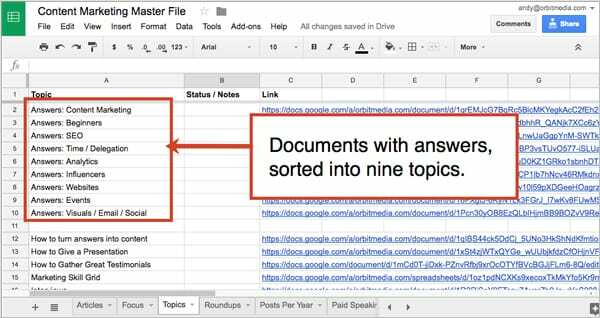 Next, scroll through the master document and look for topics and themes. The big ones will be obvious, but you might find a few surprises. Create a new blank document for each main topic. Find answers that fit into two topics? If something fits into two documents, put it in both. Find tiny fragments of answers? Grab these too. We don’t want to miss any gems, however small. We aren’t refining yet. We’re just sifting and sorting. Here’s what I did: I created a Google Doc called “Fragments” and put everything in here, then deleted it from email. When I was done, I had 92 pages of content in question and answer format. After three years of emailing my best advice, I’d written enough to fill a book! It wasn’t organized, but at least it was gathered up in one place. Now everything is sorted and ready to be crystallized into search optimized articles. Time to refine. In each topic document, you’ll find lots of redundancies. We can start removing these now. But rather than deleting things in big chunks, scan through for those sparkling little nuggets of content. Keep these. If the answer you’re adapting mentions specific people and brands, it may not be appropriate for marketing content. Change the names to protect innocent clients and friends. Replace with generic examples. Also, if you’re working with answers that appeared in roundups or interviews, change them up a bit to make them feel new and original. Headlines, images, bullet lists, links and many other elements from the web content checklist will need to be added. Point of view (you, we, us) and tone (casual, formal) may need to be adapted. There were a few posts that appeared almost instantly. These were two posts that were 90% complete and took very little time to organize into drafts. I added headlines and images and they were ready to go. Several other posts began to emerge as likely articles. These were four posts that were 50% complete, but they needed more rewriting: introductions, additional paragraphs and examples. These are currently in production. Finally, there are a handful of others that will likely to take shape down the road. They’re solid and partly written but on the back burner for now, but these three posts are 25% complete. Based on my average time to write a post (6-8 hours), this was a time savings of 32 hours. Not bad! Note: For most bloggers, the average time to write a blog post is 3 hours and 28 minutes. Assuming the same production from the same raw material, this would be 15 hours of time saved. 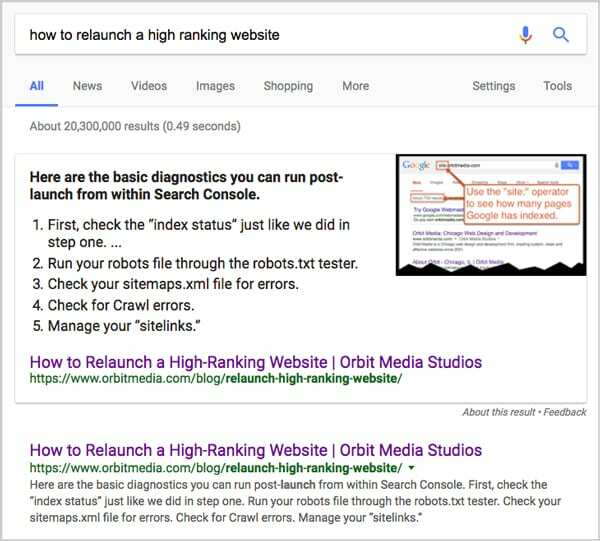 This means knowing your own domain authority and targeting other phrases only if the other high ranking pages for the phrase are in the same range of authority as you. Indicate your relevance for the phrase by using it in the title, header and body text. Also, find and use the phrases that are closely related to your topic. 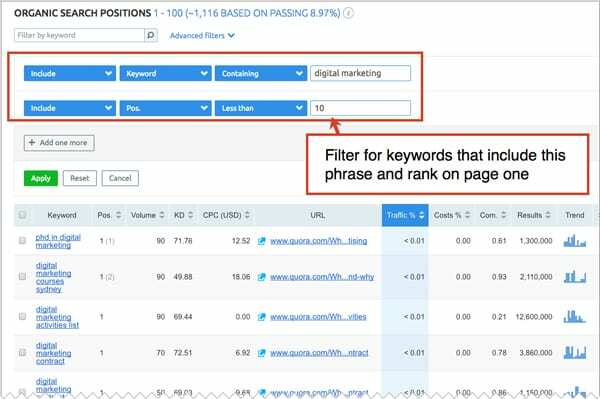 Here are some tips for this kind of semantic SEO. Since you’re starting with content that answers questions, you’ll probably target some longer, more specific phrases. If Dave wrote to ask about this, there are thousands of people looking for the information in search engines. ProTip! Make sure you include the full-sentence version of your question and answer in the article. Don’t break the meaning up across several sentences. This will increase the chance that your page will appear in the “Answer Box” in Google. Write like you’re writing for the dictionary. This is the fastest and simplest place to publish your answers. Not only does this take pressure off writing and fill your publishing calendar, but it gives you a place to send people who ask the question again later. Turn those questions into traffic! If the answers don’t fit well into your content marketing mission, then find another home for them. The internet is a big place. There’s an audience for every post. If the question and answer are part of your target audiences buying decision, then these should be published directly to your products and service pages. 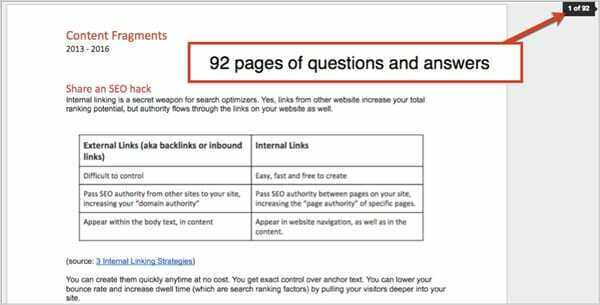 Answering questions is key to conversion rate optimization. This is your most valuable content! Here’s a bonus for you. There’s a good chance that people on Quora are looking for your answers. Just search for the question. If it’s there, copy and paste in your answer. But make sure it’s a good one. Quorans are very serious about quality. Here’s what I did: Not everything has been published yet, but I have two posts for this blog and one guest post scheduled. I also put a detailed answer into a question on Quora about digital marketing basics. Check it out. It’s very detailed! There you have it. A little forethought and organization turns email time into marketing time. It works because writing is writing and email is content. All we did was move the content from a one-to-one channel to a one-to-many channel. So plan ahead and repurpose everything! Need a few more tips on repurposing content? 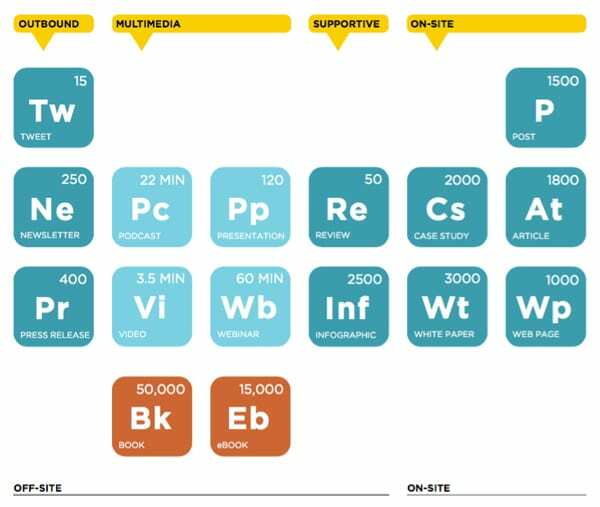 Take a look at the Periodic Table of Content. It’s our original guide for getting more value from the content you already have. This is also the post that lent its name to our book, Content Chemistry, The Illustrated Handbook for Content Marketing. Enjoy! I wanted to send you an email to ask this question )) What plugin do you use for the subscription at the bottom? I love it too! Are you going to to sell it? This is brilliant, Andy, a great resource for transforming necessary time into productive time. And inspiration! Wow. Thanks for this! Great ideas Andy. You actually gave me inspiration to look back at my proposals instead. In many cases I have written custom elements to address client specific issues, plus tried to pre-empt some answers to questions… looking at it from the perspective of your article has definitely shown me some ideas for content. Cheers! Proposals? I’ve never thought of that. Great idea. Another source of content I’ve found: internal documents. It still ranks well and people read it every day! Internal documents = rankings, traffic, links, shares, followers, subscribers, etc.